Two astronauts—one American, the other Japanese—suited up to venture outside the International Space Station to finish work upgrading the outpost’s robotic Canadarm2, a process that has now involved five extravehicular activities over some four months. The six-hour U.S. EVA-48 began when NASA astronaut Mark Vande Hei and Japan Aerospace Exploration Agency astronaut Norishige Kanai put on their suits and exited the Quest airlock. The official start time occurred at 7 a.m. EST (12:00 GMT) Feb. 16, 2018, when the duo switched their suits from station power to battery power. Their primary task was to shuffle the locations of the two old latching end effectors, or LEEs, that were replaced on earlier spacewalks. Canadarm2 has a LEE on each end of its 17-meter “arm span.” They are used to either attach the arm to the station via various grapple fixtures positioned around the outpost, to “grab” visiting vehicles and attach them berthing mechanisms, or to move humans and equipment around the football field-sized complex. Because each end has an independent end effector, the robotic manipulator can also “walk” end-over-end across the outside of the facility to move from one location to another. The old LEE-A, which was replaced in October 2017, was moved from its temporary storage location on the Mobile Base System to the Quest airlock to be brought inside for eventual return to Earth aboard a future SpaceX Dragon spacecraft. LEE-B, which was replaced last month, was moved from its temporary storage location on External Stowage Platform 2 to the spot on the MBS that LEE-A was occupying to be used as an emergency spare or as a temporary storage spot for equipment. According to NASA, the old LEE-A was in worse condition than the old LEE-B and was going to be returned to Earth for refurbishment. It is unclear when, or if, it will be brought back to space. Both of the old effectors were the originals launched during STS-100 in April 2001, and have far exceeded their planned life expectancy. Vande Hei was wearing the suit with red stripes and was designated EV-1 (the lead spacewalker). He worked with Kanai, who was wearing the suit bearing no stripes and was designated EV-2, to accomplish the primary task in about 2.5 hours. As such, NASA flight controllers directed the duo to begin work on a variety of get-ahead tasks including lubricating the new LEE-B that was installed during U.S. EVA-47. Vande Hei took point in the lubrication task, which took up the majority of his remaining time outside the outpost for this outing. Kanai, meanwhile, moved to the Special Purpose Dexterous Manipulator, also called Dextre, to install a new tool. Dextre is essentially an accessory to Canadarm2, which can “grab” onto it and use it for very delicate robotics operations. It can be used for activities that just a few years ago only spacewalking astronauts could. The tool that Kanai installed will allow Dextre to move various orbital replacement units (ORUs) around the stations exterior. Once that was finished, the Japanese spacewalker went Canadarm2’s LEE-A, which was holding the arm to the ISS via a grapple fixture at the base of the Harmony module. He installed a sensor that records the amount of force being exerted on the object the arm is holding. Once done, he made his way back to the airlock to wait for Vande Hei, who was finishing up the lubrication of LEE-B. Vande Hei was able to finish one additional get-ahead task while he was making his way back to the airlock. He slightly repositioned a flex hose rotary coupler strut on ESP-2. At the conclusion of the outing, the duo squeezed their way back inside the Quest airlock, this time with a 190-kilogram LEE before closing the hatch. U.S. EVA-48 officially ended at 12:57 p.m. EST (17:57 GMT) when the repressurization of the lock began. The duo spent five hours, 57 minutes outside the complex. Once inside, two of Expedition 54’s six-person crew members (NASA astronauts Joe Acaba and Scott Tingle) helped Vande Hei and Kanai remove their spacesuits. The old LEE-A is to be moved into the Bigelow Expandable Activity Module (BEAM), which was recently re-purposed for storage after being evaluated for more than 1.5 years as the station’s first expandable module. U.S. EVA-48 was the 208th spacewalk in support of ISS assembly and maintenance. 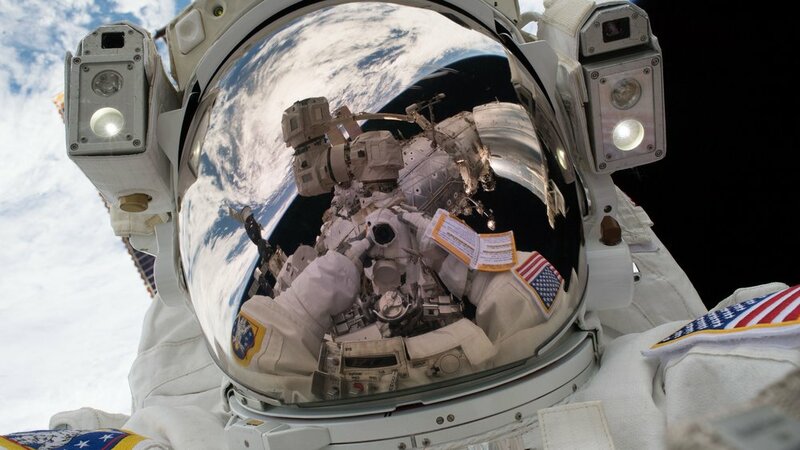 Since 1998, spacewalkers have spent a minute shy of 1,300 hours outside the complex. Today’s outing was also the third performed in 2018, including a Russian segment-based EVA on Feb. 2. This was Vande Hei’s fourth spacewalk, who’s career total now stands at 26 hours, 42 minutes. It was Kanai’s first spacewalk—the fourth EVA performed by a citizen of Japan.